Back pain is a common problem amongst most professionals in the recent times. With hectic schedule on the rise, little attention is paid to the importance of exercise. Following an exercise program benefits us in many ways. Back Strengthening Exercises, in particular, are far more useful than any medications. Maintaining a regular routine that incorporates back strengthening exercises helps to get rid of such problems forever. Back pain can occur not only due to lack of exercise but also because of prolonged hours before the computer with insufficient breaks. Stress and inflexible muscles also add to the problem. It is always better to opt for exercises to get rid of problems like these. Take a look at some basic exercise steps given below. Lie down on the floor. Your back should be flat and the legs should be kept on top of an exercise ball that should be placed beneath the knees. Now, pull the abdominal muscles towards the inside. Wait in this position for 5 seconds and avoid arching the lower back area. Hands should be placed on the sides of the body. As you get used to this exercise, both arms can be outstretched, palms facing the top side. Do this exercise about 4-5 times. Bend down on the floor placing your weight on both the hands. Knees should be bent, hands at a shoulder-width distance. Now, squeeze your abs by pulling the belly towards the spinal area. Avoid arching the spine. Then, extend the right leg back whereas the left arm should be held straight. Hold this position for 2 seconds or whatever duration possible in the initial stages. Now, repeat on the other side. Repeat this exercise 4 times for each side. Stand straight and keep the feet together. Contract abs gently and place hands on the hips. Now, take a big step ahead with your right foot. Bend down so that the right knee forms a 90-degree angle. The left leg will be slightly bent at the knees. Go back to the starting position without pausing. Repeat the same for the other leg. Do this set 10 times for each side. Stand erect with the feet away from each other. 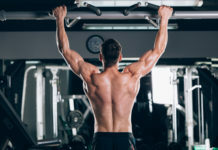 Your arms should hang loosely at the side. Now, raise the right arm overhead and bend your body towards the left. Hold this position for around 10 seconds. Slowly go back to the starting position. Follow the same procedure for the other side. These steps should be repeated at least 10 times for each side. Lie down on the floor and ensure your back is flat. Cross the right leg and place it on the left knee. With the left hand, you need to pull the raised knee towards the ground as far as you can manage the stretch. Hold this position for 10 seconds and repeat with the other leg. This exercise needs to be done 5 times for each side. Lie on the floor on the stomach, face down. Extend arms over the head and keep them straight. Next, you need to inhale and lift the arms along with your head and chest off the floor. Hold for 2 seconds and slowly bring it back to the starting position. Repeat this exercise 10 times. These exercises will stretch your back and ensure you are relieved from the pain. Following this routine daily will strengthen the back muscles and even prevent the development of such problems.